The Chalet Rofel is located in the famous town of Zermatt, surrounded by magical mountains. Get enchanted by the splendour of this alpine world. 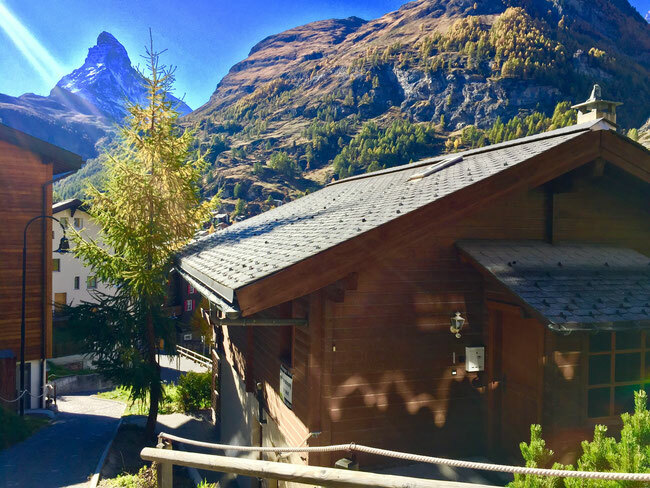 The Chalet Rofel is located in the famous resort town Zermatt in the quiet quarter Oberhäusern, only 5 walking minutes from the center. Also the skiing / walking areas are easily reachable. The flat is on the ground floor of a charming chalet with totaly two flats. The newly furnished two-room Apartment offers space for 2 - 4 persons and is ideal for couples, friends and families, who appreciate a cosy Holiday home. On the terrace you can enjoy the breathtaking Matterhorn view. Profit from some services for a special price (upon request) in the neighbouring family-run Hotel Bella Vista (1 minute by feet). For your relaxation: Entree in the spa Bella Vita for the price of CHF 28 per Person (incl. towels, bathrobe and flip-flops) and the using of the whirl bath (CHF 5/jeton) and relaxation area with Matterhorn view. Massages can be booked at the reception. Avoid long queue at the valley station and get your ticket at the reception of the Hotel Bella Vista. Stay updated and follow us on Facebook!